DUBAI - Snow has fallen over the United Arab Emirates for the first time ever, leaving a white blanket over the mountains of Ras al-Khaimah as the desert country experienced a cold spell and above-average rainfall. Dubai airport's meteorology department told AFP that snow fell over the Al-Jees mountain range in Ras al-Khaimah, which is the most northerly member of the UAE federation. The sunspot number plummeted to zero this week--a sign that solar minimum is coming. The second solar eclipse of 2004 is visible from the northern hemisphere. Notes: 13 day, 10 month, yields a 7 13 rotation around the 25th of november. RealEyes your daze. Local circumstances for a number of cities are given in Table 3. All times are provided in Universal Time. The Sun's altitude and azimuth, the eclipse magnitude and obscuration are all listed for the instant of maximum eclipse. Of special note to North Americans is that both Hawaii and Alaska will witness this eclipse at sunset. This is the 54th eclipse of Saros series 124, another old series which produced its last central eclipse on 1986 Oct 03. The event was an unusual beaded annular eclipse with a very short path just off the west coast of Iceland. Saros 124 will continue to produce partial eclipses of decreasing magnitude until 2347 May 11. Eclipse Brightness). For a special NASA web page on this event, see: Total Lunar Eclipse of Oct 27-28, 2004 . 1. ON The 33 degree Parallel! 2. The Debate is held in the Gammage Auditorium. The ASU Mascote is the SUN DEVIL. �American Freemasonry and related power elites are responsible for a number of murders and provocations to war which happened along or close to the northern 33rd degree of latitude, also known as the 33rd Parallel. Most of this planet�s six billion people live south of the 33rd Parallel. The number 33 is seen in different areas of life: The human foot has 33 muscles. The Holy Bible, New International Version, uses the word �thirty-three� seven times in seven verses. King David reigned in Jerusalem 33 years. Ronald Reagan was shot in the 3rd month on the 30th day 3 + 30 = 33. "Africanized killer bees" will not nest above the 33rd parallel. The Catholic Italian poet Dante Alighieri (1265-1321) divided his Divine Comedy into 100 Cantos: one Canto for the introduction, 33 Cantos for the Inferno, 33 Cantos for the Purgatorio, and 33 Cantos for the Paradiso. Masons and their confederates may note that Dante placed the traitors to their guests in a deep pit of Hell in his 33rd Canto of the Inferno. 1704-1662 B.C. : The Babylonian empire was based in Babylon, near the 33rd Parallel. The empire stretched from the Persian Gulf to the middle Euphrates River and upper Tigris River regions. The Biblical Mount Carmel is south of the modern city of Haifa and west of the Sea of Galilee in Israel. Mount Carmel is less than 20 miles south of the 33rd Parallel. Circa 29 A.D.: At Caesarea Philippi, near the 33rd Parallel, Jesus Christ predicted his own death (Matthew 16:22). Charleston Harbor, South Carolina, igniting the Civil War. Charleston, is known officially as �the Mother Lodge of the World.� This Lodge had been founded by Moses Lindo as the King Solomon Lodge. Late in the preinaugural banking crisis, on March 3, 1933 (3/03/33), the Federal Reserve Board and the New York Reserve Bank's Governor Harrison had agreed that the Board would issue an order closing all the Federal Reserve Banks. Near the end of World War II, on April 12, 1945, President Franklin D. Roosevelt met his �sudden death� of a cerebral hemorrhage at the 33rd Parallel at Warm Springs, Georgia. Harry S Truman was a 33rd degree as a Mason and the 33rd president. The first A-bomb exploded at the Trinity Test Site, (Almagordo) White Sands, New Mexico, at the 33rd Parallel. On August 6, 1945 at 8:15 a.m. United States B-29 bomber Enola Gay, on Mission No. 13, dropped an atomic bomb called �Little Boy� on Hiroshima, Japan near the 33rd Parallel. On August 19, 1946, Bill Clinton, the 42nd President, was born in Hope, Arkansas, at the 33rd Parallel. His parentage is disputed. As a young man, Bill Clinton was a Master Counselor of the Masonic-connected Demolay. (�Demolay� derives from the Grand Master of the Knights Templar, James deMolay (1244-1314). On July 8, 1947 a UFO and aliens� bodies were allegedly found in the desert outside Roswell, New Mexico at the 33rd Parallel. 1963: JFK Sr. was shot from the front and killed in Dealey Plaza in Dallas, Texas near the 33rd Parallel on 11/22/63 (11 + 22 = 33). Dealey Plaza is the site of the first masonic temple in Dallas. On June 5, 1968, shortly after winning the California primary election, Senator Robert F. Kennedy was shot at the Ambassador Hotel in Los Angeles, California, close to the 33rd Parallel and near a Masonic Lodge. Bagdad, Iraq�s capital, and the United Nations-enforced �no fly zone� are at the 33rd degree of north latitude. 1993 Waco, Texas, just south of the 32nd degree of north latitude, is the site of the Masonic Grand Lodge of Texas. 1997 March 13. While still shooting �Titanic,�Director James Cameron secretly traveled to Arizona to become a 32nd Degree Mason at the Masonic lodge in downtown Phoenix, on March 13th, 1997. While Cameron was receiving his initiation into the 32nd degree from his Law of One allies, millions of people witnessed a large V-shaped formation of "lights" over the city of Phoenix. Phoenix is on the 33rd parallel. over two centuries, as an imperfect nation dedicated to the preservation and expansion of individual liberties, whose Bill of Rights stands both as its greatest achievement and its most shamefully unfulfilled ideal? Or will we lurch to the right, voluntarily cashing in our personal freedom in exchange for citizenship in an empire constantly at war, reviled by the rest of the world but--until history spawns a worthy challenger--its undisputed master? Issues like gay marriage and partial-birth abortion lead to a lot of spilled ink but are relatively inconsequential in the big picture of American politics. What divides our left from our right--each of which considers the other dangerous, if not treasonous--are competing visions of the United States. Were America's military and economic dominance over the globe to fade while our living standards and constitutionally-guaranteed freedoms remained intact, liberals wouldn't fret all that much. As we've seen since September 2001, on the other hand, conservatives don't lose sleep over increasing poverty, police checkpoints, censorship or racially motivated arrests or indefinite detentions since they see those developments as supporting the primary aim--remaining the world's sole superpower. John Edwards (news - web sites) talks about "two Americas," two classes for whom opportunity is either a birthright or a pipe dream. What he describes is real, yet the other gap--between those who see the U.S. as a nation based on individual rights and those who see it first and foremost as a powerful empire--is almost impossible to bridge. Individualists and imperialists can't agree to disagree because they don't even agree on what the United States of America is, or what it should become. Republicans, who view George W. Bush as a commander in chief leading the empire into dangerous battles abroad against hostile savages, equate him with the nation itself. "Why do you hate America?" they reply to his critics. Liberals, who view presidents as taxpayer-funded employees, are inherently hostile to the notion that any one man can be the embodiment of a democratic America. They roll their eyes at what they believe to be a cheap rhetorical advice although, in fact, the conservatives are dead serious about the question. American politics are just as tribal-based as those of Afghanistan (news - web sites). But where they have Pashtuns and Tajiks, we have jocks and cheerleaders versus freaks and geeks. critically-acclaimed bands, people who believe those in authority versus those who don't. Athletes grow up to vote Republican, dorks Democratic. The great divide was chronicled by the John Hughes films of the 1980s--aggressive, bland privilege meets victimized, appealing alienation and wins--and it lives on in a classic right-wing Internet reposte to leftist posters: "You got beat up in school a lot, didn't you?" Members of the in crowd can marry those of the out crowd, work together and even be friends, but they will never share basic assumptions about the way the world works. It's hazy now, but our two tribes used to agree about a lot more stuff. Democrats and Republicans both thought that Jimmy Carter was a nice man but an ineffective administrator, that Ronald Reagan (news - web sites) was a good speaker, that Bill Clinton (news - web sites) was a womanizer. Then the 2000 election was stolen and Bush exploited the 9/11 attacks as an excuse for wars of conquest and domestic political clampdowns. Republicans demanded total obeisance, Democrats refused, and both sides began spewing red-hot rhetoric that makes them irreconcilable. So half the electorate looks at George W. Bush and sees a courageous, plainspoken man of integrity, comparable to Churchill, whereas the other half thinks he's a dullard and a pipsqueak whose strings are pulled by corrupt corporate executives. Since support for Bush or Kerry has more to do with tribal affiliation than issues or suitability for office, neither the incumbent nor his opponent's performance on the campaign trail nor the latest news on the economy or the wars budge the polls more than a few points back and forth. Incredibly, only one or two percent of the electorate remains undecided. In a few weeks, either the imperialists or the individualists will emerge triumphant. The winning constituency will claim the right to decide what kind of country the U.S. is and should be. In truth, however, the two tribes of postmodern American politics are too closely matched for any election to settle that question. I will make this proposal at tonight's NWOPC meeting. > > By November 3, U.S. occupiers will be bombing > multiple Iraqi towns and cities; recent news accounts > confirm an express intention by the Bushies to bomb > and invade up to 30 towns and cities considered to > harbor insurgents. It's all to inject "fairness" into > the coming Iraqi elections, don't ya know. > Irrespective of whether Kerry wins, this new > military escalation will happen (indeed, it has > alreadybegun), and the odds are pretty good that Kerry > won't oppose this new military imperative even if he > does win (I note that he hasn't yet spoken out against > the widely-reported probability of massive U.S. > "reliberation"). > I note that activists in Columbus are gearing up for a November 3 event, and so should we. So Gather on NO_Them_BURR FROTH DAY! Nurture everyone everywhere with kindliness. If you get bored with the Tempe debate, flux your real eyes and search for the Boeing. Pieces of interstellar matter are constantly passing through our solar system. These galactic visitors�atomic particles and bits of dust�flow through interplanetary space and may collide with the major bodies in the solar system�the earth and the other planets. Although each particle is microscopic, their total mass in the solar system is enormous. 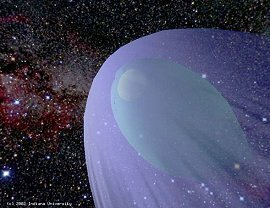 Indeed, about 98 percent of the gaseous fraction in the heliosphere�the volume of space filled by the solar wind?consists of interstellar material! How do these particles interact with a planet's environment? Do they have a significant impact on a planet's atmosphere? No one knows. "George W. Bush is completely incompetent, but he and his entire administration are corrupt as well. Let's not disguise the fact that their decisions and actions have always been to the benefit of big business and the to the detriment of working people. His appointments to regulartory agencies coming directly from industry lobbying organizations are a clear conflict of interest and again benefit his cronies. It's not just incompetence.. it's pure corruption. 450 billion for Zombie Military AmeriKKKan war and 0.0 for America the Republic. TODAY!!!! ZOMBIE Greenspan said that it was wrong for the government to hold out the promise of more retirement benefits than it is capable of providing. "If we have promised more than our economy has the ability to deliver, as I fear we may have, we must recalibrate our public programs so that pending retirees have time to adjust through other channels," Greenspan said. "If we delay, the adjustments could be abrupt and painful." You know it's time for a serious change when the president of the United States actually mutters the infantile, instantly infamous line, "Our enemies are innovative and resourceful, and so are we. They never stop thinking about new ways to harm our country and our people, and neither do we," just after finishing phonetically spelling out his name, in his favoritest red crayon, on yet another budget-reaming $417 billion defense-spending bill. And you know it's time for a change when not a single one of the rigid and spiritually curdled military yes men standing around the ceremonial signing table, those sad automatons with their wooden smiles and stiff spines and bone-dry souls, not one broke into a hysterical bout of sad, suicidal laughter, followed by uncontrolled wailing and the rending of flesh and the muttering of oh my freaking God what the hell is this man doing as leader of the free world. Disturbing information about Bush's drugged mind and 9/11 cover up. It's difficult to think of anyone who has inflicted more harm on Americans than their current president." "I think this is the worst government the US has ever had in its more than 200 years of history. It has engaged in extradordinarily irresponsible policies not only in foreign policy and economics but also in social and environmental policy..."
"It will take the United States decades to recover." potentially the most corrupt, unethical and undemocratic White House in history"
Bush�s erratic behavior and sharp mood swings led White House physician Col. Richard J. Tubb to put the President on powerful anti-depressant drugs after he stormed off stage rather than answer reporters' questions about his relationship with indicted Enron executive Richard J. Lay, but White House insiders say the strong, prescription medications seem to increase Bush�s sullen behavior towards those around him. the President suffers from �character pathology,� including �grandiosity� and �megalomania� � viewing himself, America and God as interchangeable. That will make him the first President since Hoover not to have added jobs on his watch. It has been a very difficult four years. The 5.6% [unemployment] rate sounds low, but if you add the people who are underemployed or have stopped looking, the underemployment rate is probably closer to 10%. And if you're unemployed, you're stuck: The duration of unemployment is about as long as it has ever been. In June [the average] was 19.9 weeks -- it doesn't get much longer than that. bear all the hallmarks of the one warned about in the Book of Revelations--the anti-Christ." Before he became pope, Karol Cardinal Wojtyla said, "We are now standing in the face of the greatest historical confrontation humanity has gone through. I do not think that wide circles of the American society or wide circles of the Christian community realize this fully. We are now facing the final confrontation between the church and the anti-Church, of the Gospel versus the anti-Gospel." The pope worked tirelessly to convince leaders of nations on the UN Security Council to oppose Bush's war resolution on Iraq. Vatican sources claim they had not seen the pope more animated and determined since he fell ill to Parkinson's Disease. In the end, the pope did convince the leaders of Mexico, Chile, Cameroon and Guinea to oppose the U.S. resolution. Madsen contends that "Bush is a dangerous right-wing ideologue who couples his political fanaticism with a neo-Christian blood cult." 3. Instead of a new distributor stepping right in -- as all the media predicted would happen -- it took another month to find distributors who would take on this movie. A number of other distributors, thanks to various pressures, were afraid to get involved. It looked for a while that we would be distributing this ourselves. But then Lions Gate and IFC Films rode in to the rescue!So, we have beaten back all attempts to kill this movie, and the only thing in the way of you now seeing "Fahrenheit 9/11" is this Republican big-money front group trying to force theaters not to show the movie. I appreciate their efforts, but you don�t have to be a member of MoveOn to help stop this effort to keep �Fahrenheit 9/11� from making it to screens across the country. If a theater in your area is planning to show the film, just give them a call and thank them for standing up for the freedom of speech. If your local theater isn't showing the film, call them and let them know that you would like to see it and you'd like them to show it. The White House and their minions in our media have presented one distorted version of the truth after another for the past four years. All we are asking for is the right to show what they HAVEN'T shown us, the real truth. The truth that ain't pretty (and is, sadly, damningly hilarious). On top of all this, the MPAA gave the film an "R" rating. I want all teenagers to see this film. There is nothing in the film in terms of violence that we didn't see on TV every night at the dinner hour during the Vietnam War. Of course, that's the point, isn't it? The media have given the real footage from Iraq a "cleansing" -- made it look nice, easy to digest. Mario Cuomo has offered to be our lawyer in appealing this ruling by the MPAA. Frankly, I would like to think the MPAA is saying that the actions by the Bush administration are so abhorrent and revolting, we need to protect our children from seeing what they have done. In that case, the film should be rated NC-17! movie. If the government believes it is OK to send slightly older teenagers to their deaths in Iraq, I think at the very least you should be allowed to see what they are going to draft you for in a couple of years. Thanks again for your support and I hope to see you at the movies on opening night, June 25. PS. I am sponsoring a number of benefits around the country next week for local and national peace and justice groups, including Military Families Speak Out and September 11th Families for Peaceful Tomorrows. Please check your local papers and my website next week for further details. PPS. Also, I am going to be on the �Late Show with David Letterman� on Friday night. It's on CBS at 11:35 PM Eastern and Pacific. And on Monday morning (June 21) I will be on �The Today Show� on NBC. Next week, Jon Stewart and Conan. I'd go on O'Reilly but, like a coward, he walked out on a screening we invited him to (with Al Franken just a few rows away!). I personally caught him sneaking out. Embarrassed, he tried to change the subject. He said, "When are you coming on my show?" and I said, "Turn around and watch the rest of the movie and I will come on your show." He walked out. Fair and balanced. June 10, 2004: Like a canary in a mine, a microbe can often sense environmental dangers before a human can. It's easy to see a canary's reaction. But how can you can you tell what a microbe's feeling? How can you coax a microbe to communicate? One way is to interface it to a silicon chip. University of Tennessee microbiologist Gary Sayler and his colleagues have developed a device that uses chips to collect signals from specially altered bacteria. The researchers have already used these devices, known as BBICs, or Bioluminescent Bioreporter Integrated Circuits, to track pollution on earth. Now, with the support of NASA's Office of Biological and Physical Research, they're designing a version for spaceships. Sayler's group, which includes Tennessee researchers Steve Ripp, Syed Islam and Ben Blalock, as well as collaborators at JPL and the Kennedy Space Center, has bioengineered microbes that glow blue-green in the presence of contaminants. Then they joined those bacteria to microluminometers--chips designed to measure the light. What BBICs offer, explains Sayler, is a low-cost, low-energy way to detect pollutants. They're tiny: each BBIC is about 2 mm by 2 mm, and the entire device, including its power source, will probably be about the size of a matchbox, and they monitor their surroundings continuously. NASA is interested in sensing contaminants because spaceships are tightly sealed. Unseen fumes from scientific experiments or toxins produced by molds and other biofilms can accumulate and pose a hazard to astronauts. BBICs can be crafted to sense almost anything: ammonia, cadmium, chromate, cobalt, copper, proteins, lead, mercury, PCBs, ultrasound, ultraviolet radiation, zinc--the list goes on and on. The system is surprisingly rugged. Microbes thrive in a wide range of environments, so it's possible to design BBICs that can survive in extreme or highly contaminated surroundings. "They can actually do their job sitting in things such as jet fuel-water mixtures," marvels Sayler. Although the microbes can protect themselves from toxins, they still have a variety of needs--food, for example. Keeping them alive, Sayler says, "is a significant portion of the work." One problem is that microbes must be immobilized so that they remain right next to the chip. The challenge, says Sayler, is trying to figure out how to immobilize the microbes in such a way that they survive as long as possible. The researchers are testing various substances that will keep the microbes in place. Something with good optical transparency is critical, of course, so that if the microbes light up, the chip can perceive that. The immobilant has to be porous, so that any contamination can flow in, and reach the microbes. It has to contain nutrients for the microbes to feed on. It has to allow the microbe enough, but not too much, room. "We're basically trying to feed the immobilized organisms in the matrix without them growing. We really don't want them to grow very much, if at all. If they grow, it changes the total amount of cells in the system, and it confounds the issue of how much light corresponds to how much contaminant." Sayler hopes to develop gels in which the microbes can be kept functional for several months. The sensors would probably be attached to the spaceship walls, continuously monitoring the ship's atmosphere. They'd monitor themselves, too, to make sure that the microbes were still viable. "We can electrically induce cells to make light, so we can pulse the system every once in a while to see if the organisms are still physiologically active." "After, say, six months, the chip would send a signal that says, 'oops, time to replace your bug sensor.' An astronaut would go and get a freeze-dried package of seed microbes, add a little moisture, and stick it in the sensor." Nothing more has to be done until the next time the signal goes off, six months later. It's a low maintenance system. These BBICs are useful on Earth, too. They can detect formaldehyde emitted by pressed wood furniture or hard-to-detect molds often implicated in sick building syndrome. "If this device works as planned, it could turn out to be a very inexpensive kind of monitoring system," says Sayler. "You could go to your corner drugstore, buy one of these, take it home and stick it up on your wall. It could tell you whether your carpets are degassing, or whether you've got problems like black mold." Advanced BBICs could serve as bioterrorism monitors for Homeland Security, as a means to detect DNA radiation-damage in astronauts, or as a diagnostic tool for doctors. An example: Sayler envisions BBICs as part of a treatment program for diabetics. An implantable BBIC equipped with an on-chip radio transmitter could monitor blood glucose levels and communicate with a remote insulin delivery system. Such devices could also scan body-fluids for certain proteins that signal tumors--in other words, an early warning system for cancer. Much more research needs to be done before these ideas become reality. Making BBICs work on spaceships is a good place to start. A national alarm will be set off Thursday. It won't have to do with a terrorist attack; it's more critical. Thursday is when the Inequality Matters conference begins in New York City to discuss the biggest wealth and income gap -- and its consequences on society -- since the Hoover Administration. The Congressional Budget Office says the income gap in the United States is now the widest in 75 years. While the richest one percent of the U.S. population saw its financial wealth grow 109 percent from 1983 to 2001, the bottom two-fifths watched as its wealth fell 46 percent. Alarming? You bet. And here's why: The number of Americans without health insurance climbed 33 percent during the 1990's, according to the U.S. Census Bureau. The biggest indicator of a healthy society -- average life expectancy -- has dropped. People in the U.S. now don't live even as long as people in Costa Rica. Meanwhile the U.S. infant mortality rate has risen, so much so Cuba has a better success rate of bringing healthy children into the world. Citing those facts and figures, James Lardner, who heads Inequality.org, says "there is no way you can deny the power of money." He, along with Bill Moyers, Barbara Ehrenreich and numerous other leaders, activists and institutions hope to bring some of these startling facts "to the front burner of politics." In an election year, you'd think these issues would be on the "front burner" already. But these overarching social trends reflect poorly on politicians and the government -- those supposedly elected to protect those members of society who can't protect themselves. Indeed, politics, and access to the process will be addressed at the conference too. "McCain-Feingold is not nearly as effective as it should be," says Lardner. The campaign finance reform act he's speaking of is easy to poke holes in this year, as John Kerry runs against George Bush's $200 million war chest. Beyond the campaign, political policy will be highlighted. For one, the Bush tax cuts for the wealthy exacerbating the disparity between rich and poor. Even the wealthy themselves are concerned about the long-term ramifications of tax policy. Members of United for a Fair Economy (who include billionaires and the wealthiest of our country, such as Bill Gates and Warren Buffett), are calling for the estate tax to remain, despite its scheduled elimination in 2010 following phased-in declines. Buffett says the estate tax helps to keep America's "meritocracy" in check. Repealing the estate tax could create an aristocracy based on wealth, he says. The war in Iraq, of course, obfuscates many of these disturbing long-term trends. That's why "it's something we have to focus on now," says Betsy Leondar-Wright, spokesman for United for a Fair Economy. With military casualties and terrorism high on many people's minds, it might be difficult to shift national attention. And for that, the Inequality Matters conference matters. Instead of putting the nation on high red, orange or whatever color alert this summer, instead of spending almost $200 billion dollars (so far) for the wars in Iraq and Afghanistan and sending more than 100,000 young people to fight overseas, perhaps those resources and that money could be put to use to make us truly a more healthy nation. Wouldn't that be a more admirable model to show the world than the Abu Ghraib photos? In just 14 days the problems of the poorest countries in the world -- starvation, lack of education, scarcity of potable water, etc. -- could be solved if each nation donated its military spending budget for just that period of time -- 14 days. As it stands, the United States and other developed nations have even fallen below their commitments to the World Bank, which helps fight social causes like poverty and education. Three billion people are living in "poverty" on less than two dollars per day, 800 million people lack access to basic health care, 17 million people -- including 11 million children -- die every year from easily preventable diseases and malnutrition, 2.4 billion people lack access to proper sanitation, 1.1 billion do not have safe drinking water, 275 million children never attend or complete primary school education and 870 million of the world's adults are illiterate. The toll there is a lot bigger than the casualty count coming in from Iraq. But it gets much less press. If the Inequality Matters meeting can articulate just one message, its title would do. MAY 2004 Who Tests Voting Machines? henever questions are raised about the reliability of electronic voting machines, election officials have a ready response: independent testing. There is nothing to worry about, they insist, because the software has been painstakingly reviewed by independent testing authorities to make sure it is accurate and honest, and then certified by state election officials. But this process is riddled with problems, including conflicts of interest and a disturbing lack of transparency. Voters should demand reform, and they should also keep demanding, as a growing number of Americans are, a voter-verified paper record of their vote. "The trigger for the 911 activity was the imminent and unstoppable world-wide financial collapse which can only be prevented temporarily by a major war, perhaps to become known as World War III. To bring it off one more time, martial law will probably be imposed in the United States." Opportunity Mars rover used its Panoramic Camera to watch the rare solar crossing of the Sun by the martian moon Deimos Thursday. The rare solar transit of the martian moon occurs only twice per Mars year (one Mars year equals roughly two Earth years). Deimos is a dark body that appears to be composed of C-type surface materials, similar to that of asteroids found in the outer asteroid belt. Named after the Roman God of dread, Deimos is the smaller of Mars' two moons. Deimos whirls around Mars every 30 hours. The natural moon is 10 by 7.5 miles (16 by 12 kilometers) in size. A woman entrepreneur from Singapore is harvesting cool, clear water from unconventional sources in a trend-setting business that could help quench Asia's growing thirst for renewable aquatic resources. Olivia Lum, founder and chief executive of water treatment firm Hyflux Ltd., is churning out big bucks by offering technology that can purify water from rivers and seas on a commercial scale. Hyflux also makes an appliance that can extract moisture from the air and turn it into drinking water in a home or workplace. Using advanced membrane technology to screen out water impurities, the company has grown from humble beginnings in 1989, with only a seed capital of 20,000 Singapore dollars (12,000 US dollars), into a publicly listed firm now worth 487 million dollars. Hyflux has begun construction of a 200 million dollar seawater purification plant here in Singapore's first attempt to tap the ocean surrounding the island to reduce its dependence on imported water from Malaysia. It also has investments in water treatment plants in China and plans to bid for the right to build and manage Singapore's fifth plant that will convert water flushed from sewers into potable water. The growth potential for water treatment companies such as Hyflux in the Asia-Pacific region is enormous, experts say. As rivers and other sources become more polluted, there will be a growing demand to purify raw water for drinking and industrial purposes using safer and more technologically advanced methods, Lum said in an interview. A report by the Asian Development Bank says 830 million people living in the region's developing countries do not have safe drinking water and more than two billion lack sanitation facilities. The shortage has resulted in a high rate of water-borne diseases and deaths, it said, warning water scarcity will also affect food security in some parts of the region and could increase tensions between countries sharing the water resources. "As people see that they will not be able to use the traditional method of purifying water from rivers because of pollution, the traditional method can no longer give the kind of comfort level in terms of quality, in terms of efficiency," Lum said. Lum, 42, said her company's main focus will be in China, where it operates four water treatment plants and is building a fifth one. Forty-four percent of Hyflux's revenues in the last fiscal year came from its China operations. With its foothold in China, Hyflux is setting up a distribution network in Asia and the Middle East to market its latest product called Dragonfly, an electrical appliance that decondenses air moisture to produce drinking water. A membrane system and an ultra-violet lamp inside the machine purifies the water, which is dispensed either hot or cold. The air-to-water machine, costing just over 1,000 US dollars, will compete with bottled water as a low-cost alternative. Lum's story is a powerful, rags-to-riches tale of how an impoverished village woman from neighbouring Malaysia made it big in the Singapore and the Asian corporate world through a never-say-die attitude. Abandoned when she was a baby, Lum was adopted by an elderly woman whom she called grandmother. She grew up amid poverty and blight in a former tin-mining town in the Malaysian state of Perak. "Every morning when you woke up, you would hear people crying, quarreling, fighting because of poverty," she recalled in the interview. "Sometimes in the morning when you open your door, you see bloodstains all over because there were gang fights. "We were living in that area, and generation after generation they didn't seem to have any improvement in life." It was that thought which propelled her to achieve higher things by getting an education. She came to Singapore in 1978 to study, and working while studying, she finished a university degree and was employed at a multinational company as a chemist in charge of environmental treatment. It was in this job that she thought of smaller firms which could not afford to treat and dispose of waste. "I thought that in no time they're gonna dump all their waste into rivers without treatment. Over time, people will have no fresh water to drink," she said. "I embarked on water treatment from then on. I dreamed about it and decided that I wanted to give it a try." Resigning from her job despite objections from concerned friends, Lum sold her house and car and Hyflux was born. Lum, who eventually became a Singapore citizen, has been held up by the government as an example to encourage would-be entrepreneurs. But remaining humble despite her achievements, the still unmarried Lum said she does not relish being a poster girl for entrepreneurship. TOKYO - (AFP) - The most recent Japanese winner of the Nobel Prize for Physics questioned the validity of a multi-billion dollar nuclear fusion project his country is competing for against France to host. Masatoshi Koshiba, 77, who shared the Nobel physics prize in 2002, told AFP that he had warned that the experiment to emulate the sun's nuclear fusion might not live up to its billing in an article more than three years ago. The 10 billion dollar International Thermonuclear Experimental Reactor (ITER) project aims to produce the clean, safe, inexhaustible energy of the future, but once operational, it is not expected to generate electricity before 2050. "I wrote ... that the popular project ITER is like what is said in ancient China: 'Sheep head and dog meat'," Koshiba said, speaking in English. "This implies that the shop says it is selling sheep meat but actually they are selling dog meat." Koshiba said he had also pointed out that before it could become the next energy source, nuclear fusion had to be proven to be both safe and economical, but no one had any experience in dealing with the sort of power it could unleash. He added that the resulting energy could cost more than estimated if operations had to be halted to replace absorbers or walls. But the professor emeritus at the elite Tokyo University said he was also "scared" that scientists were not in charge of the project. "This project is not in the hands of scientists any more but in the hands of politicians and businessmen, so there is no chance scientists can make any change," he said. The project is a joint effort between the European Union, the United States, China, Japan, South Korea and Russia. The partners will share the cost, but competition is intense to host the project. The partners are to vote in late February on whether the French town of Cadarache or the northern Japanese village of Rokkasho-mura should house it. They failed to decide on the site at a meeting in December, with Japan drawing backing from the United States and South Korea, while France won support from China and Russia. Earlier this week, Japan's science minister argued that the Rokkasho site would win out on a fair assessment of technological merit, but suggested one country might house the reactor site and the other an information centre. What I didn't expect in this collection of essays was Vidal's stunning, but intuitively obvious expose of the apparent decision to allow the attacks of September 11. While most complacent, sheep-like Americans will dismiss this as more "radical left conspiracy theory blather", how else can one explain that fact that 4 commercial aircraft were hijacked simultaneously, lost control with air traffic controllers for one half hour and allowed to attack the nation's largest city, and its capital, also simultaneously, without any response from the most powerful military on the planet? To assume Vidal is incorrect would assume that the entire eastern seaboard remained entirely vulnerable to attack prior to September 11. This is hardly likely, and Vidal points out the incentives and historical precedents. That his assertions aren't far fetched is being supported by the Bush Administration's ongoing stonewalling of investigations of the events of September 11. ALL Nuclear Power plants are corroded. � 160 million years of radiation poisoning now facing humanity. Temperatures dropped well below zero Saturday across the Northeast, making it the coldest day in a decade for some cities and keeping all but the hardiest people indoors. St. Johnsbury, Vt., led the list of records Saturday with a low of 27 below zero, the National Weather Service (news - web sites) said. Unofficially, Saranac Lake, N.Y., reported 34 below. Boston's Logan International Airport recorded a low of 3 below zero, two degrees chillier than the previous record for Jan. 10, set in 1875. It was the city's coldest day since Jan. 16, 1994, when thermometers registered 4 below. MARS: Tonight is a good night to look at Mars. NASA's six-wheeled rover Spirit landed there less than 24 hours ago, in a place called Gusev Crater. Spirit is beaming some wonderful images to Earth--you've probably seen them on TV or on the web. But are you ready for a break from screens? Tonight you can step outside and see Mars with your own eyes. Visit Spaceweather.com for directions and a sky map. EARTH AT PERIHELION: Earth's orbit around the sun isn't a perfect circle, it's an ellipse. One side is closer to the sun (147.5 million km) than the other (152.6 million km). Today, January 4th, we're at the closest point, known to astronomers as perihelion. The sun looks a bit bigger than average and sunlight falling on Earth is a few percent more intense. SOLAR WIND: Today (Jan 1) Earth is inside a solar wind stream flowing from a coronal hole on the sun. This is stirring mild geomagnetic storms and some auroras at high latitudes. The annual Quadrantid meteor shower is one of the year's finest, yet people seldom see it. The shower peaks in early January when northern skies are frequently cloudy, and the chill air discourages lingering outdoors. If you've never seen the Quadrantids, this weekend might be a good time to try. Forecasters expect a flurry of meteors, perhaps 25 to 60 per hour, on Sunday morning, January 4th. Sky watchers in western Europe and eastern parts of North America will have the best view--weather permitting. BAM, Iran - Rescue workers pulled three more survivors from the rubble of Bam's devastating earthquake, including a man saved Thursday after nearly seven days buried under a flattened house. Relief crews restored some electricity and rushed more aid into the ruined ancient city. A provincial official said the death toll from the Dec. 26 2003 pre-dawn quake would top 30,000 but that it would not reach 40,000. Iran's orphanages are rapidly filling as aid workers deliver young survivors to the provincial capital of Kerman, 120 miles northwest of Bam. An estimated 1,500 children have been recovered without family so far and are being held at orphanages. Earth's magnetic north pole is racing away from North America. Compass needles in Africa are drifting about 1 degree per decade. Globally the magnetic field has weakened 10% since the 19th century. What's happening to our planet's magnetic field? Researchers are seeking the answer. In this story we see what they've learned in recent years.